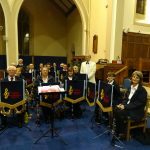 A small Band was asked to play in the Candlelight Carol Service held in Victoria Methodist Church. A ‘first’ for the Band. They accompanied some of the Carols & played two spots during the Service. The Church Choir also sang & readings were read by members of the Church. 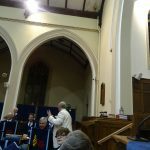 One of the choristers, Jill sang a Solo accompanied by the Band. 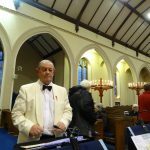 The honour of playing a short recessional concert was given to the RAFA Band. Peter made sure a selection of Festive music involving the Choir & Congregation, sent those who attended Service home with a Christmas ‘glow’. A few RAFA Members from the Weston Branch & Central HQ Leicester also attended the Service.